Atlanta's first and oldest TV station concluded nearly sixty-one years of analog transmissions at the end of their noon newscast with this little gathering in the station's transmitter room. The honor of turning off the analog signal is given to longtime Channel 2 newsman Don McClellan, who went really formal for the occasion (he was in his 50th year with WSB-TV at the time). He is assisted by Ray Moore, presumably Channel 2's chief engineer. Since the video runs a little over a minute, one can only wish that the festivities could have went a little longer. WSB-TV's historic hometown rival WAGA-TV Fox 5 ceased its analog activities at the same time (12:30 PM), and their switch-pushing ceremony was slightly better.  WSB (Welcome South, Brother) Television, the video spawn of WSB Radio AM 750, began operations near the end of September 1948. It is the second-oldest TV station in the South after WTVR Channel 6 in Richmond VA. WSB-TV originally operated on Channel 8, the first of three Atlanta stations to occupy that channel (Georgia Public Broadcasting flagship station WGTV is the current occupant). When James M. Cox, owner of The Atlanta Journal, launched WSB-TV, the Channel 2 allocaton for Atlanta belonged to The Atlanta Constitution's WCON-TV, which had not yet signed on. When the Journal and the Constitution merged in 1950, the two TV stations were merged into one, resulting in WSB-TV's switch to the more powerful Channel 2. For its first 32 years (1948-1980) WSB-TV was affiliated with the NBC network. It swapped networks with WXIA-TV Channel 11 (the second occupant of Channel 8 from 1951 to 1953) and became Atlanta's ABC network station in 1980, which still is today. WSB-TV is still the flagship TV station of the Cox Media Group, making Channel 2 among the few TV stations launched in the 1940s and 1950s still licensed to the entity that launched it.